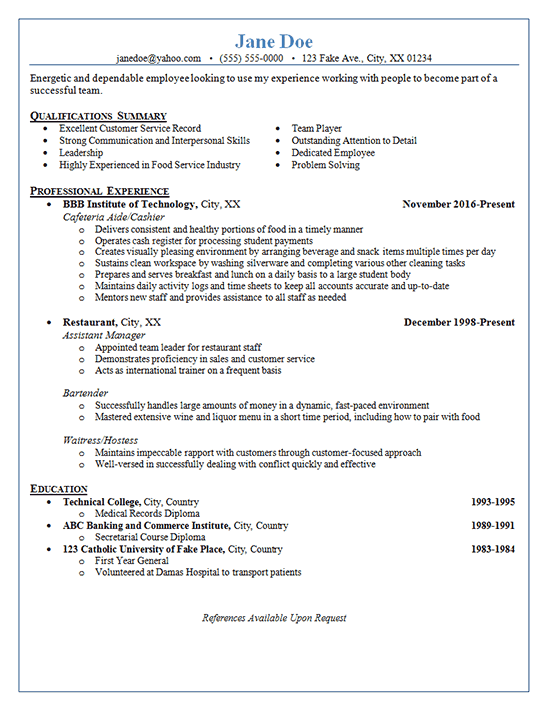 This restaurant server resume was created for someone that has spent a lot of time in the foodservice industry. While she has slowly worked her way up at one of her current positions, she is looking for a more significant promotion that brings about more responsibilities as well as income. In general, resumes are designed to help someone truly highlight their best attributes and accomplishments that relate to future employment. With that in mind, three important steps were taken. A qualifications summary was added to begin the resume that allowed us to pull in her best qualities from each position into one impressive list. Also, bullet points were constructed so that they were not specific to one particular place of employment, but instead could be transferred to any establishment. Finally, her position at “Restaurant” was broken into separate sections for each role that she has served. This allowed for an in-depth explanation of specific responsibilities that continually increased in importance. Also, these changes filled up the page better and gave the resume a more pleasing layout. The resume concluded with an Education section to demonstrate that the client is well-educated, even if it’s not directly related to her employment goal. Delivers consistent and healthy portions of food in a timely manner. Operates cash register for processing student payments. Creates visually pleasing environment by arranging beverage and snack items multiple times per day. Sustains clean workspace by washing silverware and completing various other cleaning tasks. Prepares and serves breakfast and lunch on a daily basis to a large student body. Maintains daily activity logs and timesheets to keep all accounts accurate and up-to-date. Mentors new staff and provides assistance to all staff as needed. Appointed team leader for restaurant staff. Demonstrates proficiency in sales and customer service. Acts as international trainer on a frequent basis. Successfully handles large amounts of money in a dynamic, fast-paced environment. Mastered extensive wine and liquor menu in a short time period, including how to pair with food. Maintains impeccable rapport with customers through customer-focused approach. Well-versed in successfully dealing with conflict quickly and effective.